The sight of two longbeard wild turkey toms in full fan caused me to stop the car and pull over. A third gobbler, a decently long tassel hanging from his chest, was skulking off from the scene dominated by the competing, fanning pair, surrounded by three or four hens. I lost count of all the birds because I could not take my eyes off those displaying toms. The thing that struck me was that the birds were clearly unalarmed and oblivious of me, sitting in an idling car not 40 yards away, so intent were they on courtship. And they were absolutely silent. I watched them for at least 10 minutes before moving on, and not once did any of the birds utter an audible sound. It was like watching an old silent movie from the 1920s. It was a great chance sighting, but also an object lesson. The birds do not call when there is no reason. Once gobblers have found hens, the rest mostly is acting. And they are in no hurry. You cannot rush a good thing. The chance meeting was just that – chance. I had not actually been scouting, although in a sense, turkey hunters always are scouting. But it reminded me it was high time to start staking out my hunting territory for the spring. And to dust off the “Banana” – my trusty, old, bolt-action, peep-sighted Mossberg 12-gauge with the bulbous variable choke and camo-cloth-tape wrap. The faithful old gun patterns well, but I make sure to pattern it every year at 30 and 40 yards, my outer limit, just because. It got the Banana nickname because I bought it, used, decades ago, only to find it had a crooked barrel, which an old gunsmith “re-regulated” for me in a press. It works just fine, slightly curved barrel and all, and it comes with that story. 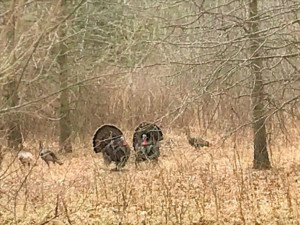 Now it’s a matter of some serious scouting and listening, and counting down that glacially slow-moving calendar to April 22 – Earth Day to the general public, but opening day to most Ohio turkey hunters.